Member of the Electronic Dance Music group, MAKO, Alex Seaver speaks with guest host Peter Dugan and French Horn player, Zach Potts. This episode of From the Top was recorded in the famed Hollywood Scoring Studio in Los Angeles. We meet a brilliant young pianist who grew up in Hollywood enjoying film music so much that she founded her own multi-disciplinary arts collaborative at her high school. Also on the program is a heroic performance of a piece by Planel for horn and a teenage violinist rocks Ravel's virtuosic "Tzigane" with guest host Peter Dugan. From the Vilar Performing Arts Center in Beaver Creek, Colorado, this week's From the Top features the ground-breaking violinist Charles Yang as the guest host. He'll share the stage with a joyful teenager whose winning personality propelled her to take home the gold medal at the prestigious 2018 Stulberg International String Competition. We'll also meet a young erhu player, an instrument known to some as the "Chinese violin", who plays "Taichi Warrior of Erhu" by Chen Jun. This week's guest host is Molly Yeh a young chef with her own show on the Food Channel called "Girl Meets Farm." But before she developed an interest in food, she was an extraordinary classical percussionist who appeared on From the Top over a decade ago when she was just 15-years-old. This week, she returns to introduce us to an impressive lineup of young musicians including a talented teenage bassoonist from rural Oklahoma and a 17-year-old pianist who delivers a fiery performance of Stravinsky's Firebird Suite. Guest Host Molly Yeh is a young chef with her own show on the Food Channel called "Girl Meets Farm," but before she developed an interest in food, she was an extraordinary classical percussionist who appeared on From the Top over a decade ago when she was just 15-years-old. This week, she returns to introduce us to an impressive lineup of young musicians including a flutist who performs music inspired by the great Maya Angelou and a 14-year-old cellist who gives a dazzling performance of the music Tchaikovsky. Guest host Orli Shaham's complete break piece recorded during From the Top Episode 361, Brunswick, ME. Featuring music and interviews with From the Top alumni who are now professional musicians, this Where are They Now episode brings a delightful mix of performances of Ravel, Gershwin, Schumann, and an original work from one of From the Top's up-and-coming composer alumni. This week on From the Top, legendary jazz pianist Fred Hersch collaborates with young performers with guest host Yuga Cohler. We hear a teenage pianist join Hersch in a piano duo performance of Samuel Barber, an award-winning string quartet wows the audience with Mendelssohn, and a young cellist performs one of Hersch's original compositions, "Bittersweet Tango". PERFORMERS: 14-year-old violinist Hina Khuong-Huu, 17-year-old pianist Avik Sarkar, The Kairos String Quartet, 19-year-old cellist Lydia Rhea. From Purchase, New York, this week's From the Top highlights the 115 incredible young musicians that make up Carnegie Hall's National Youth Orchestra of the USA. Featured on the program are four performances by the full ensemble under renowned conductor Marin Alsop including an adrenaline-inducing performance of John Adams' "Short Ride in a Fast Machine" and a newly-commissioned work by composer Gabriela Lena Frank. Christopher O'RIley and teenage violinist, John Fawcett talk about nuanced bowing technique. From the campus of the University of California, Berkeley, this week's From the Top features the winning ensemble of KDFC's Local Vocals High School Choir Sing-Off and, at 120 singers, it's the largest choir ever featured on the program. We meet a 17-year-old pianist with a moving story to tell about losing access to her beloved piano for financial reasons and how she overcame that situation ... and a young string quartet performs the rhapsodic first movement of Debussy's string quartet in G major, Op. 10. Guest Host Peter Dugan created a special arrangement in honor of the late Aretha Franklin and his hometown of Philadelphia and performed it during the live recording of NPR's From the Top Show 359. Christopher O'Riley and Conrad talk about Conrad's vibrant career as a composer and pianist and we hear his new piece, "Asymptotes." From Santa Barbara, California, this week's From the Top features fantastic musicians who are studying at the prestigious Music Academy of the West, which celebrates its 70th Anniversary this year. We'll hear a young pianist perform one of Rachmaninoff's most complex pieces for the piano, a teenage violinist recounts a life-changing realization, and we feature a world-premiere of "Asymptotes", a newly commissioned work for clarinet, viola, and piano from composer and From the Top alum, Conrad Tao. From the Media Arts Center at Roxbury Community College, this episode of From the Top brings together a cast of fantastic young performers with an all-student audience! We meet a remarkable 13-year-old pianist who shares how much happier she became when she stopped comparing herself to others, a teenage trombone quartet performs two pieces back-to-back that were composed centuries apart, and students from the audience ask the performers questions onstage. Parsa Sabet Rasekhi talks with host Christopher O'Riley about his journey to America from Iran and then performs his own composition. "Snowflight." From Las Vegas this week's episode features a teenage piano performing a bombastic piece for two pianos by Lutoslawski, a young guitarist shares his moving story about fleeing Iran to study music in America, and a 13-year-old violinist wows the audience with Paul Nero's whimsical show piece "Hot Canary." Conductor JoAnn Falletta and host Christopher O'Riley discuss the state of music training and education in the United States. From Buffalo, New York this week's episode features some of the best young musicians in the country performing concerto repertoire with the Buffalo Philharmonic Orchestra under the direction of JoAnn Falletta. A 15-year-old pianist performs a frothy piano concerto movement by Beethoven, a teenage cellist, who's parents are actually players in the orchestra, performs Shostakovich ... and the Buffalo Phil plays a new work by an 18-year-old composer. From one of the most prestigious teenage music competitions in the country, this episode of From the Top doubles as a documentary featuring the Stulberg International String Competition! In addition to adrenaline-filled performances from three young musicians striving for first prize, we'll hear from the organization's executive director and one of the judges. Host Christopher O'Riley speaks with a teen saxophone quartet and their coach about the growing popularity of saxophone quartet music and why sax quartets are so versatile. From the Texas Music Educators Association Conference in San Antonio, Texas, this week's inspiring recording of From the Top features a fantastic line-up of all-Texas performers alongside special guests Black Violin! We'll meet a young bassoonist who's willing and able to play any instrument his band director needs covered, an award-winning saxophone quartet performs an exquisite piece by Guillermo Lago, and all the young performers join guests Black Violin on stage for their fun reimagining of "Simple Gifts" by Joseph Brackett. Peter Dugan and Kara Dugan sing Gershwin's "Embraceable You." This week From the Top comes from the Bremen Jewish Heritage Museum in Atlanta, Georgia. In honor of that setting, the young performers celebrate Jewish themed music and the music of Jewish composers. We'll hear a teenage violinist perform Ravel's gorgeous Kaddish, a wonderful Atlanta-based youth choir sings a piece by a contemporary Jewish composer, and we'll meet a young guitar player who is one part Texan and one part Israeli. 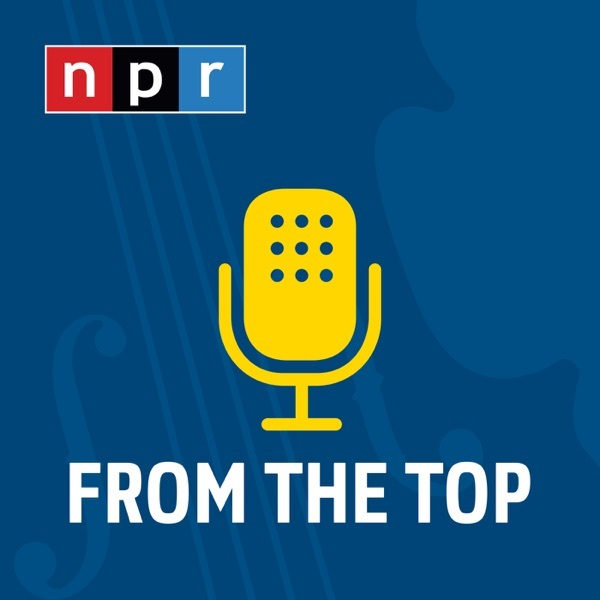 Recorded live on stage during From the Top's Annual Gala in Boston, this episode features incredible young musicians and a special appearance by NPR's All Things Considered Emeritus Host Robert Siegel. We hear a soprano sing a beautifully ethereal piece by Debussy, a teenage violinist shares how his love of hip-hop inspires him to communicate the power of music to his audiences, and a 10-year-old pianist from Missouri performs an exquisite piece by Chopin. Host Christopher O'Riley talks with 17-year-old violinist Alexander Goldberg discuss the work of Robert Schumann. This week's show comes from our hometown of Boston, Massachusetts where we meet an accomplished local pianist who made her Carnegie Hall debut at the age of 7, a young musician who's the second ever double bassist to win the prestigious Stulberg International Strings Competition performs Bottesini, and we get to know a teenage violinist who is also a whiz at New York Times crossword puzzles. Host Christopher O'Riley and 17-year-old percussionist Gabriel Costache discuss how to make percussion instruments "sing." From Austin, Texas, this week's From the Top features a nuanced and emotional performance of Rachmaninoff's Prelude in G Sharp Minor, opus 32 by a 14-year-old pianist from California, we'll meet a teenage oboist local to Austin who's also been a world champion knife thrower ... and a young percussionist from Denver performs a mesmerizing piece on the marimba. Host Christopher O'Riley talks with teenage pianist Amir Siraj about Stravinsky's Petrouchka and Amir's Iranian heritage. From Boston, Massachusetts, this week's program features a brilliant 12-year-old cellist from Hackensack, New Jersey performing a sonata by Shostakovich, we enjoy a beautifully detailed performance of a Sibelius Mazurka by a young violinist ... and we meet a teenager from Massachusetts, who, in addition to being an outstanding pianist, has also received serious recognition for his work in environmental science. Christopher O'Riley speaks with three leading teachers of Chicago's teenager chamber music scene. From the Midwest Young Artists Conservatory in Highwood, Illinois, this week's From the Top features a line-up of all Chicago-area young musicians, including a fantastic teenage piano trio playing Cassado and seven members of the Percussion Scholarship Group of Chicago. From York, Pennsylvania, this week's From the Top features outstanding young musicians soloing with the York Symphony Orchestra under the direction of conductor Lawrence Golan. We'll enjoy a 17-year-old's performance of one of Schumann's most beautiful works for cello, a teenager that switched his focus from soccer to clarinet thanks to a life-changing concert experience, and a young violinist tackles Bruch's Violin Concerto No. 1 with the York Symphony Orchestra. Host Christopher O'Riley coaches 14-year-old violinist, Sena Cho in a rehearsal of the first movement of the Grieg Violin Sonata. From Longview, Texas this week's program features a 12-year-old pianist from East Texas performing the music of Paderewski, a heartfelt performance of Faure's "Elegy" performed by a teenager from the Chicago area and we'll hear a moving from the young flutist on the program who's rancher grandfather sold much of his herd of cattle to support her musical studies. From Danville, Kentucky, this week's From the Top features a 10-year-old violinist performing the music of Edward Elgar — she also shares some colorful stories of growing up in Kentucky with her 6 siblings. Also on the program, a beautifully detailed classical guitar performance by a young man from South Carolina and Chopin performed by a talented teenager from Massachusetts. 18-year-old pianist and composer, Andrew Guo and host Christopher O'Riley discuss the compositional assignment that inspired his piece "7 Images for Piano." This week's From the Top comes from Miami, Florida where we got to hear a talented local teenager perform the music of Schumann and enjoy his stories of growing up in the Cuban community of Miami. Also featured on the show is an eleven-year-old pianist who performs two works by Chopin, and a violinist performs the beautiful and dramatic second movement from César Franck's Sonata for Violin and Piano. 16-year-old pianist, CoCo Ma reads segments of her YA novel to host Christopher O'Riley and performs the music of Ginastera.